Professor John Ioanidis from Stanford University spoke at The Cochrane Colloquia in Vienna yesterday. 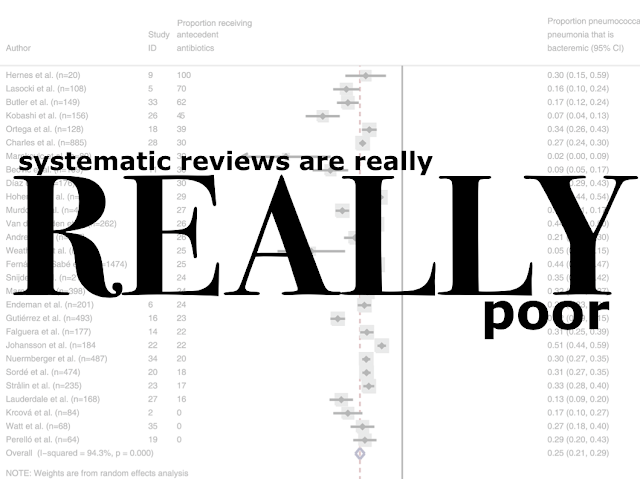 His opinion on systematic reviews in biomedical research is that they are unreliable. 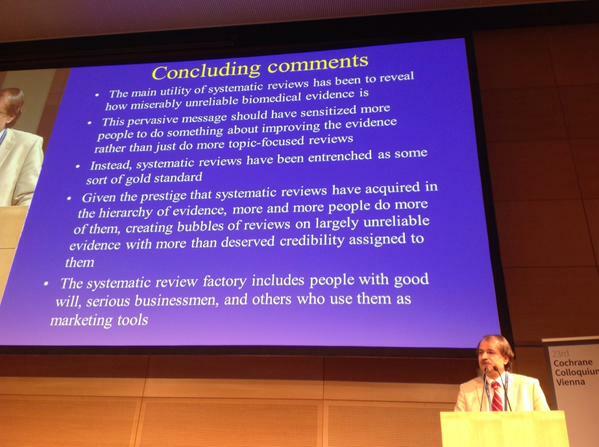 I know this because I searched on Twitter using this string ” John Ioannidis #cochranevienna ” This is a great value in social media that without being at the conference I am able to receive wisdom shared in another place. @kesleeman @SarahChapman30 wow… don’t show @ffolliet ! What followed was an interesting and valuable discussion demonstrating both the huge value of twitter and its limitation. I hope to expand a little here and would really value comment. There is no doubt that the original slide is…challenging. (And it is part of a set, more of which can be seen here.) My rationale on that is explained more clearly in lots of blog posts. Such a slide is a script. I don’t know that Prof Ioanidis actually read the slides verbatim but it will be very difficult not to do so. If he didn’t, the audience definitely would and that will stop them effectively listening to the speaker and significantly restricts their ability to think about his talk and worse still, to remember it. Text on slides is very bad. However, the slide effectively communicates the message to those outside the lecture theatre as indicated in the twitter discussion. We can read the thoughts of the speaker without being present at the actual meeting. It is highly likely that that is an unintended consequence but raises the question of whether speakers should intentionally make slides for those not physically present at meetings? No. And yes. No, we should prioritise and value the audience to whom we are physically speaking. Yes, we should recognise that there is a greater audience (hopefully) to our thoughts and consider means to engage with them. The reason Prof Ioanidis was asked to speak at the meeting is that that the organisers recognised his wisdom and insight and felt it would be of value to hear that live. His opinions are well recorded and are freely available to download. That is the essential difference between a speech and document. The audience are there to listen, not to read. His slides, well, his slides reflect a widely held view of what makes good slides. They aren’t designed for wider dissemination, I expect. His best method of effectively communicating with a wider audience is to either time summary slides to be tweeted as he speaks (see what my friend Jonathon has developed here) or to have someone, such as the conference organisers, do this for him.